Over the years a corporate image has been developed with Joan & David for their retail units, in a manner suitable for the UK market. EJA have carried out over fifty store designs for Joan & David, mostly in the USA. 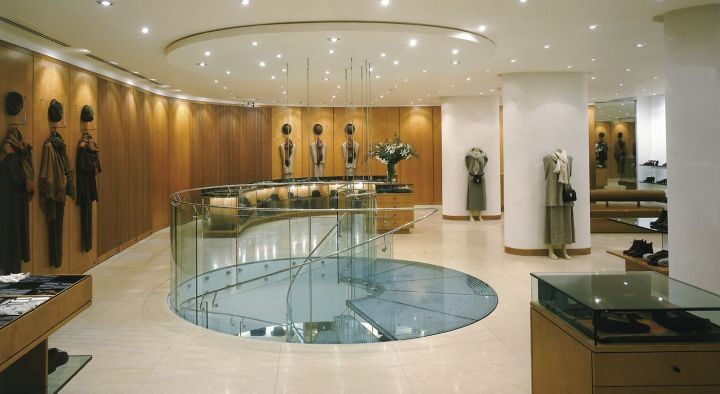 The client had already opened two outlets in Harvey Nichols but wished to have a flagship store in the West End. The existing shop unit (450 square metres over ground floor and basement) was located on a prominent corner of New Bond Street, close to Berkeley Square. In addition to converting it into a boutique for the sale and display of high-quality designer shoes, EJA were to provide space for an expanding range of ready-to- wear and accessories. A large stock area and staff facilities were also required. EJA were asked to prepare designs in April 1994, and the shop opened on 23 August after a sixteen-week contract period. The layout of the shop maximises the use of extensive glazing on two sides, for both display and transparency into the heart of the shop. In effect, the display within the shop becomes the shop window.The long side wall is expressed by the introduction of curvaceous cantilevered glass shelves; integrated within these is a concealed lighting system which highlights the shoe collection. A fretted timber screen encloses the other wall,-giving filtered views to and from the street-This wall curves into a solid timber wall to soften the far corner. The freestanding display units and counters follow this basic geometry and, together with the existing columns and the relocated staircase, provide a strong central axis and a clear and easy circulation pattern - as well as a variety of spaces for display and seating.The spiral staircase uses a curved spine wall clad in steel panels to support glass treads via stainless-steel outriggers and glass balustrading. A glass landing at ground-floor level and a reflecting glass well at the base of the stair accentuate its transparency. The basement, smaller in plan, uses all available wall space for display, forming a composition around the staircase. Details and materials have been carried through from the ground floor to provide a coherent atmosphere, yet allow the lower level to feel comfortably self-contained. A limited selection of materials is used in a variety of ways through- out the shop.The flooring is in a warm 'Deschamps' stone, laid in 900 x 900 mm tiles. For the display units, stained maple is combined with leather upholstery and glass. Fibrous plaster columns and modulated plaster ceilings are painted, and lighting is a combination of low-voltage spots, metal halides and fluorescent sources.